One of the most common retina disorders the New Jersey Eye Center treats is macular degeneration. The condition slowly destroys your central vision, making it difficult to recognize faces or read. However, it is generally painless. If you suspect you have macular degeneration, or if someone you care about has just been diagnosed, read on. “Age-related macular degeneration”, or AMD, occurs when the retina grows thinner as people age. It’s the leading cause of vision loss – more than cataracts and glaucoma combined. The US Centers for Disease Control and Prevention says 9 million people in the USA had the disease in 2010. By 2050 that figure could nearly double. People over 55 tend to be most prone to macular degeneration. Sight loss is usually gradual, but in rarer cases it can be much quicker. However, your peripheral vision remains, meaning that you do not go completely blind. However, people with very severe macular degeneration are effectively blind. There is no simple cure for the disorder. However, lifestyle adaptations can help. Some of the things you can do to slow the onset of the disease are: Eat a nutritious diet, take regular exercise, and wearprescription sunglasses to protect your eyes from ultraviolet light. In some cases, taking vitamin supplements can help. Regularly monitoring your weight, blood pressure, blood sugar and cholesterol levels can help. Talk to your doctor and consult an eye specialist if you notice significant changes in any of these. Eye doctors recommend a regular eye exam for people over 65. Our treatments at the New Jersey Eye Center aim to help patients make the most of their remaining vision. For example, magnifying lenses make reading easier. As with most diseases, early diagnosis of macular degeneration can help patients better adapt and cope. The state of your vision alone is not sufficient to understand your underlying health and pathology. Anyone with a history of macular degeneration in their family, or any level of diabetes, should have a baseline evaluation. We strongly recommend this, as many retina disorders, if detected in time, can be rectified. After such an evaluation, we would advise on the next steps. We recommend patients with “dry” macular degeneration come for check-ups every six months. These patients require only optical coherence tomography testing, ocular tomography, and occasionally an angiogram. We often prescribe certain vitamins to help stabilize their vision. We can usually detect the rarer “wet” form of the disease during an eye examination. For this we use ocular tomography and fluoroscein angiography. 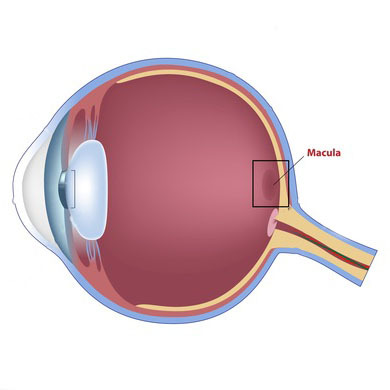 The macula is in the center of the retina. It sends images to the brain via the optic nerve. It’s responsible for focusing images. It allows us, for instance, to read, see fine details in artwork, drive a car – in short, operate normally in society. The causes of age-related macular degeneration are complex and require further research. The main risk factor is age. Other risk factors include family history, smoking, and race (with Caucasians more prone to the disease than other ethnicities). Macular degeneration can also occasionally occur in young people. An inherited genetic disorder is usually the cause of juvenile macular degeneration. Types of this disease are Stargardt’s disease, Best’s disease and Sorsby’s disease. The latter often begins in people aged 30-40. Wavy or slightly blurred vision is the most common early symptom of macular degeneration. Another symptom is that you may find you need brighter light in order to read. These symptoms are most common in the most frequently encountered form of the disease – “dry” AMD. Yellow deposits under the retina, called drusen, are a further indication of “dry” AMD. Your eye specialist can carry out a dilated eye exam to determine if you have drusen. “Dry” AMD usually leads to gradual vision loss. It occurs when cells in the macula deteriorate. “Wet” AMD, though much rarer (10-15 per cent of cases), can be more dangerous and lead to rapid sight loss. 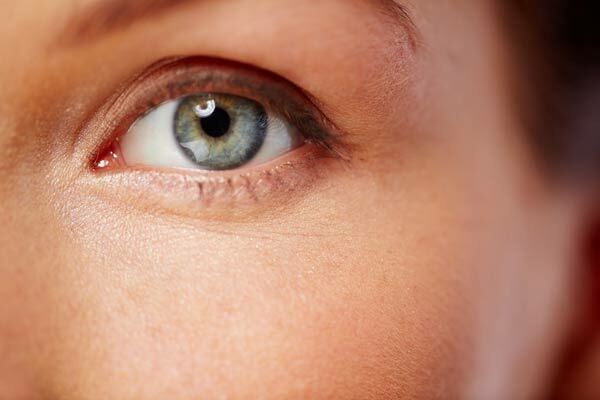 “Wet” AMD occurs when fragile blood vessels appear under the retina and leak, causing scarring or retina distortion. There are three stages of AMD: Early, intermediate and late. Regular eye check-ups help determine which stage of the disease a patient may have. Yellow deposits near the retina could indicate early AMD; larger pigment changes in the retina could indicate intermediate AMD; noticeable vision loss is a characteristic of late AMD. Macular degeneration can be debilitating. Ensure that you see a specialist to get the best advice. Short Description: One of the most common retina disorders the New Jersey Eye Center treats is macular degeneration. The condition slowly destroys your central vision, making it difficult to recognize faces or read. However, it is generally painless. If you suspect you have macular degeneration, or if someone you care about has just been diagnosed, ensure that you see a specialist to get the best advice.